“Clemson Memorial Stadium has been held in high esteem for many years. Whether it be players from the 1940s and 1950s, opposing players from the 1970s and 1980s, or even professional players in the 1990s, the ambiance of this special setting is what college is. Preserving the heritage of a nationally recognized football program was at the heart of the interior selections for the Clemson University’s West Zone stadium renovation and addition. The renovated facility caters to some of the school’s most dedicated fans and alumni with events, dining experiences and gameday gatherings. In addition, the West Zone houses the newly constructed players and coaches areas including locker rooms, offices and common spaces. The ability to incorporate the school’s time-honored spirit colors of purple and orange along with the well-known tiger paw emblem was inherent in the design of all furniture and textiles selected. The most expansive and bold statement of Clemson’s tradition can be found on the floor. 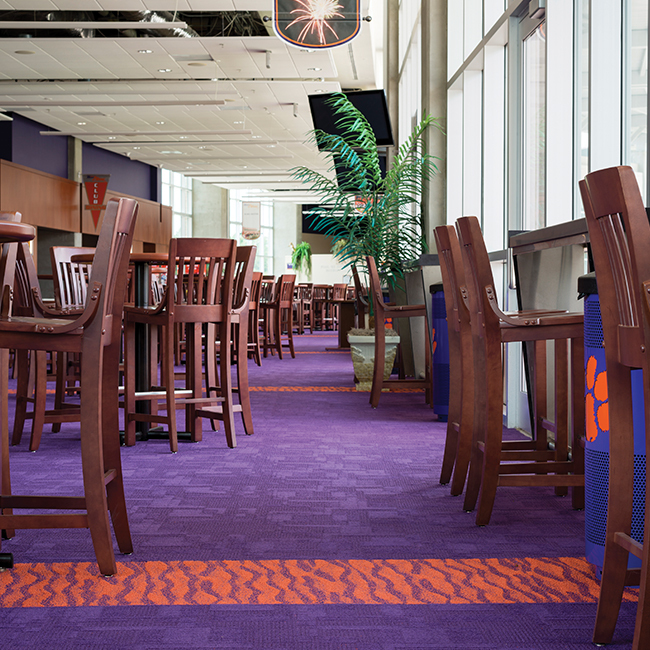 After collaborating with Clemson Facilities & Grounds Department, the Bonitz Flooring Group out of Greenville, SC selected Invision as the lead supplier of the West Zone carpet. Once complementing patterns were selected, the design team at Invision color-matched the orange and purple by simply using rich skein dyed nylon. The custom colors were incorporated to easily use each pattern as an accent for the other without visually competing. The purple Invision Cosmopolitan featured subtle hints of orange while the vibrant Invision Realm featured a base of the Clemson orange with organic streams of purple. 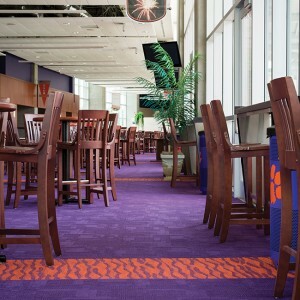 In each area of the facility, the two patterns were strategically placed to offer a bold, yet harmonious, aesthetic for the Clemson Tigers.